What Type Of Exit Device Is Right For Your Building? Home » Blogging » What Type Of Exit Device Is Right For Your Building? All properties are required to have the correct emergency exit devices readily available. This is done to ensure that everyone inside the property will be safe at all times. It is a sure proof security measure which plays a very important role in any establishment. Having a visibly clear escape route within the structure is essential for safety purposes. Whenever the need arises, exit devices will help protect people from getting hurt. Depending on the type of building you have, it would need a specific type of Emergency Exit Devices. It is important to choose the most suitable one for your building to maximize its purpose. It’s best to keep in mind that the right choice depends on the exit device’ convenience, reliability, compliance to state regulations and being systematically aligned. Let’s take a look into What Type of Exit Device is Right For Your Building? The main purpose of exit devices is to promote safety and security within a building. It is strategically located in specific areas of the establishment with the use of an emergency door. It is created to be very easy to use so that in case of emergency situations, people inside the building will be able to exit as quick as possible. Exit devices are also visible even in dark conditions. It is essential not to put any other extra lock or mechanism which might hinder its main purpose or confuse people. Exit bars are usually placed in areas where extra security measures are required. The most common examples of this are places which are vulnerable to loss of valuable products, assets or productive work time. It restricts access coming from the outside. However, a key code is usually required before a person could successfully exit a room or building using it. 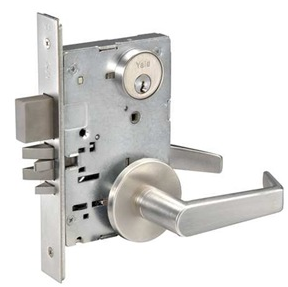 It is a type of hardware which is a locking device. It consists of a bar placed across which is placed within a particular door. Once the bar is pushed, its door latch responds quickly. This ensures that there will be no delays for exiting during emergencies. A vertical cable or rod is used to utilize a pair of doors. The latches and rods are usually concealed within the inside part of the doors or surface mounted on the face. The Surface Vertical Rod also known as SVR displays the top and bottom rods starting from the top coming towards the floor. After it’s been pushed, the rods quickly retract to unlock the ends and become released. This allows a person to exit the building safely within just a few seconds. The other type of vertical rod is called Concealed Vertical Rod or CVR. This is usually preferred whenever the owner of the building wants to ensure that the aesthetics looks polished. The CVR do not disrupt the overall door design because it’s hidden from view. It’s a great option to ensure enhanced security while maintaining the door’s beautiful appearance. A Rim Device is one of the most common types of exit devices used in buildings. It is a kind of exit hardware which is popularly known for being cost efficient and reliable. It is usually used for single doors or a pair of doors which have a vertical mullion in between them. In single doors, the strike plate is normally surface mounted on the mullion or the frame. On the other hand, in a pair of doors it is commonly attached to the active door. A double door strike is then mounted onto the inactive door. The rim device is named after the use of a latching mechanism which is taken from the rim locks used in the early 20th century. Similar to the regular mortise lock, the mortise device is mounted at the cavity or edge of a door. It is highly preferred because of its heavy duty properties which ensure that it won’t get easily tampered. It is perfect for buildings which require the highest security measures. Once a person presses the push bar, its tail shaft also called a spindle begins to rotate and releases a latch bolt. This allows the door to swing open quickly which allows people to exit the building swiftly. It requires a locksmith to be installed correctly because of the labor intensive methods attached to it. Do I Need An Access Control System Installed? How Easy Are Car Keys To Replace? What Is A Garage Door Safety Mechanism? Lose A High-Tech Car Key? Call Your Locksmith!